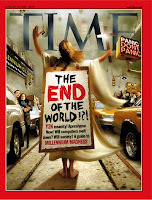 I was recently pointed to this CNN article about a band of Christians who claim that the end of the world is going to be on May 21. Leaving their lives behind, they have formed a caravan that is going around the country warning people of the coming judgment. This is not the first time a small sect of Christians with an over-realized eschatology have pronounced a ‘turn or ‘burn’ message of impending doom (not even the first time from the leader of this group!) I have several criticisms about their message and something I’m challenged about at the same time. First, my criticisms. 1. The members of this group have no assurance that they are going to be among the elect. One person was quoted, “If I’m here on May 22, it means that I wasn’t one of the elect.” What a distortion of the doctrine of election! The way that the article makes it sound, election is just a fanciful whim of God not based at all on the saving work of Jesus and faith. I find it very troublesome that a person could have such conviction about the veracity of the end, but no confidence that he/she will be on the winning side. You have no way of knowing that you are part of the elect until the event actually happens?! Though unconditional election may be founded in the heart and mind of God, the evidence of that election certainly is not. Holiness, the fruit of the Spirit, and good works – these are signs of regeneration which is a sign that you are the elect. On a practical note, if even leaving my entire life behind to join this crusade doesn’t guarantee me rapture, then why bother? 2. Their mission is not to save anyone, but only to warn? What good is a warning if there is no offer of deliverance or salvation? Imagine that you’re driving down a road, and your brakes are out. Is it enough of a duty to just tell you that the bridge ahead of you is out? Just a warning? That doesn’t seem very compassionate at all. 3. There’s no mention of Jesus, atonement, or resurrection. In everything that was reported about their message, there’s no talk of the cross, the victory won there, or atonement. Only that Christ will return. No wonder that these folks have no assurance that they’ll participate in the rapture. Theirs is wishful thinking, not at all based on the objective work of the cross. 4. Any claim to specialized knowledge (whether from study of the Scriptures or angelic announcements or visitations) needs to be scrutinized and subject to a larger body of witnesses especially if that knowledge is said to be for the world (or even a church). While I am open to the Lord giving visions to individuals concerning personal salvation, Harold Camping’s claims smack of Gnosticism, a 2nd-3rd century heresy in which those who are saved boast of a secretly revealed knowledge. How is it that Camping had such clever insight when no one else does from the same Scriptures? Any sort of claim to privatized, subjective, specialized revelation needs to be cautiously examined. On a related note, this story reminds me of the tension we see in Scripture concerning the end times. On one hand, the Scriptures say that no one knows the hour of the Lord’s return likening it to a thief sneaking up on you in the night (1 Thess 5:2-4; 2 Pet 3:10; Rev 3:3, 16:15 among others). On the other hand, the Scriptures also suggest that there will be signs to accompany the Lord’s return (eg: Matt 24; Mark 13; 2 Thess 2). What to make of this dilemma? Some scholars have suggested that Paul’s own eschatology changed as his early expectation was the imminent return of Jesus. Upon delay, Paul revised his eschatology to look for signs. I don’t have space on this post to exegetically treat these topics. I’ve written a paper to resolve Paul’s apparently contradictory teaching in 1 & 2 Thess. Email me, and I’ll send it to you. I would also point you to some good Gospel commentaries to think about how Jesus saw his own return. What we do need to recognize, however, is that there is a tension, and this tension should inform our ethics now. Which brings me to the lesson I was reminded of by these would-be prophets. For all that I disagree and disapprove of, I love that their belief that the Lord’s return is only about two months away has caused them to act. Think about it. If our world knew the end was coming on May 21 and really believed it, would they spend it trying to warn people and live holy lives or would they spend it on themselves, wantonly pursuing a lifestyle of hedonism and nihilism (eat, drink, be merry, for tomorrow we die)? However mistaken these folks might be, this much is true – they are acting on it. That’s it! In light of the resurrection, don’t just toss in the towel. Don’t just put your head up in the clouds. Don’t just pursue your own fancies here. Live for Jesus in the now knowing that his coming again is as certain as the fact that he’s raised from the dead. So in a strange way, I’m challenged by the over-realized, end times, doom-and-gloom prophets. I think they’re dead wrong, but I’m challenged to live out my faith in obedience, mission, and deliberate intention as I wait for and usher in, the return of Jesus. >I agree, it has been a challenge to me as well. Great insight Mitchel, thanks for commenting on this interesting topic. p.s. we should plant a tree on the 21st!